"William Kenney Recalls His Life As A Business Man and His Work With Habitat For Humanity"
William Kenney, also known as “Bill”, has spent his entire life trying to make a difference in the world and in people’s lives. Today this Canadian born man is 88-years-old and still making a difference. He’s lived an amazingly diverse and successful life. “During the war, I was only 20-some years old and everyone was gone. If you showed some initiative you could do anything,” Kenney said about his job in the factories. He then served in the Canadian Navy from 1943 to 1946. During the summers while he was in school he worked with “big railroad hotels” he said. He was contracted to work for the Canadian Pacific Railway hotels where he was in charge of the kitchen during the summer time in Lake Louise, Canada at a world famous hotel called Banff Springs. “I would just see that everything was going well. I had to see that all the employees got fed,” he said. In 1949 he graduated from the University and began traveling around looking for work. He went to England and became interested in Billy Butlin’s Holiday Camps, all-inclusive vacations, which at the time were popular and spread all over England. As he tried to get into the program, the England and Swiss Institution had him travel all over Switzerland. While there he went to Lucerne, Switzerland in the mountains, a place with three and four star hotels. Kenney recalls only being able to get there by boat and funiculars. While there he met the general manager. While on his travels he visited a hotel in Rhone Valley that needed help with book keeping. After his travels in England and Switzerland he returned to Canada and worked for Canadian National Hotels. He worked at the Jasper Park Lodge as a relief clerk where he roomed guests and worked at the transportation desk but still he wanted more. “I had a wonder-lust. I always wanted to get my own business and I thought America was it,” Kenney said. Kenney worked as a night manager at a restaurant and had taken a cooking course in the city or Toronto. “I had kitchen experience but I wanted food experience,” he said. So he came to the U.S. and went to the CIA, Culinary Institute of America in New Haven Connecticut which then led to a job with an industrial caterer. Kenney, who was always looking for new ideas, said that in 1954 his restaurant was the first to try microwaving. He said it was as big as a refrigerator and cost $3,000 and never exactly worked right. He also toyed around with telephone ordering systems (much like Sonic has) to order food. “Here we are in Radford with all these new inventions but I guess it’s just my nature,” Kenney said. In 1956 and 1957 Biff-Burger's began popping up everywhere. Kenney saw the first one in Clearwater, Florida and decided he had to get into the burger business. And thus, the beginning of Kenney’s burger business began. It all started in a Franchise called Biff-Burger. Kenney said the first Biff-Burger was in Radford in an old Dairy Queen Store. In 1958 he opened one in Roanoke on Williamson Road. By the end of his business venture he had opened 12 Kenney Burgers in the Roanoke Valley and 52 throughout the states of Virginia and West Virginia. Kenney kept ownership of a few of the buildings, but most of them were sold to other franchises like Kentucky Fried Chicken and Dairy Queen. “Those are things that helped me. I’m not rich but the good Lord’s taken care of me,” Kenney said. After Kenney Burgers, Kenney began working for Eastern Sales and designed kitchens. Being the business man he is, Kenney also began pioneering convenience markets, he called Bantam Markets. He had 12 Bantam Markets in Roanoke and 19 scattered throughout Virginia. Kenney said he also had the idea to sell gasoline, but the oil markets wouldn’t let him put gas in- and now they all have gasoline he said! Later on in life he began offering his business expertise to others around the world by working with the International Executive Service Core (IESC). Through his work with IESC, he’s traveled to Egypt, Bulgaria, Siberia, Russia and many other places selling American goods and helping entrepreneur’s start businesses, expand businesses, and make tasteful business decisions. So what’s the man famously known as the ‘burger man’ up to these days? Well not long ago Kenney and his wife, Connie, were at Hollins University where they ran into a guy that loved Kenney Burgers. Thus they began honoring Kenney’s Day. Ingredients were gathered and Kroger donated 1,000 quart jars to allow them to bottle the famous Kenney sauce to sell during Kenney Day. 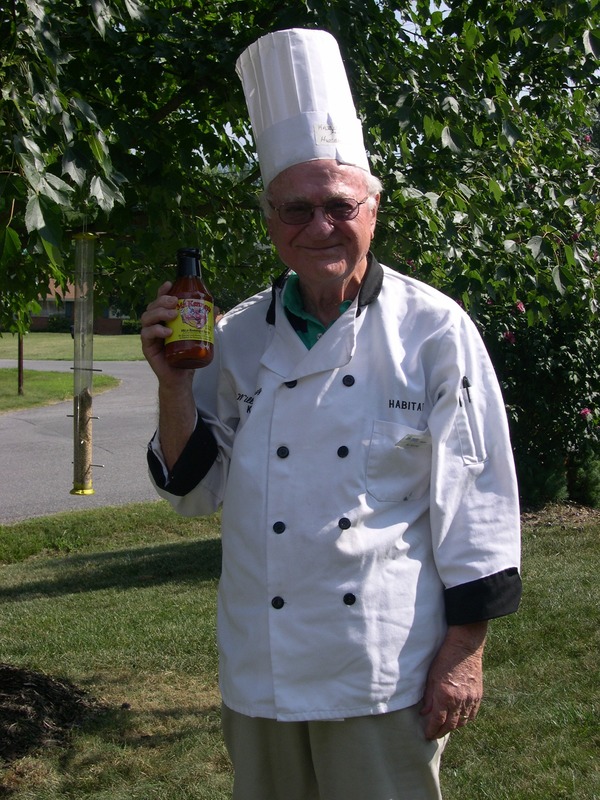 Until of course, he ran into Bob Profit, Head Chef at Roanoke College who offered to let them make the sauce at the college. After finding a cannery located in Franklin County that would allow them to make their sauce, they began making even more giving half the profits to the school and half to the Habitat for Humanity. They eventually had to have a bottler bottle it and put the nutritional values on it. The bottle even features a caricature of Kenney, done by caricature entertainer, Kyler Edgell Mickle. Kenney doesn’t just help Habitat out by raising funds, but he has always helped work on about 100 Habitat homes, he said. He also started raising funds by recylcing alumnum cans. Kenney helps sit out Habitat boxes to collect the recycled cans and picks them up every Monday to cash them in. All of the money goes tot Habitat as well. Copyright © 2009 SWoCO -The Roanoke Times. All rights reserved.